doorLink 490 & 491 Raised Ranch Panel - The Wright Door Co. 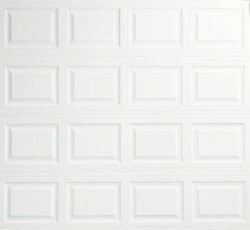 The Raised Ranch Panel garage door style is a popular choice for many homes because it is so classic and versatile. It can be used on newer construction and older homes, and looks great on either! The doors are made with thick, premium steel and the exterior has a detailed wood grain finish that is easy to clean and maintain. You can choose from many options, colors, and windows to fit these doors to your home. Please read below to see technical specifications and options from DoorLink. Includes .25 mil rust inhibiting primer and .75 mil exterior top coat that resists fading and chalking while providing consistent color from panel to panel and long life. Heavy-duty metal styles give strong rigid support for all hinges, rollers and operator attachment. Enhances your home’s energy savings, makes your door operation quieter and reduces exterior noise in your garage.